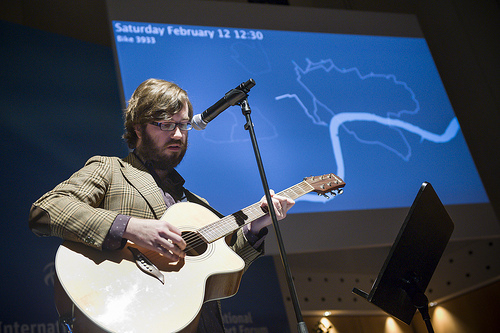 This is me playing a song about bike data at a recent conference in Germany; I’m a songwriter, and a scientist, but I’m certainly not very young. During “I’m a Scientist, get me out of here” earlier this year, school-age students asked me a lot of questions about my work that gave me a run for my money. Well, pretty soon they’ll have a chance to shine on the musical front too. With the help of the amazing people at Geek Pop and Einstein’s Garden, we’ll be running a competition to find the next generation of young science songwriters. Young musicians will be able to upload recordings of their own songs for a panel of musical and scientific judges to pick the winner. These can be recorded in a studio, on a computer, or on a mobile phone! We want to hear the best songs about physics, biology, chemistry, neuroscience, palaentology, botany, engineering,… any type of science, in fact. The winner will win tickets for them and a guardian to come to the Green Man festival in sunny south Wales. They’ll also take part in a workshop to write science songs in Einstein’s Garden, the sciencey corner of Green Man, putting their songwriting skills to good use. People who know me will know I’m a very sociable physicist. And here at UCL-CASA, we’re always thinking of new ways to use things we’ve learned in physics and maths to understand cities and countries and the way people use them! So this year, there will be a special Institute of Physics prize for the best song about “The Social Physicist” – and entrants can interpret that however they want! We’ll be putting up all the details of how to enter soon, and more information about the prizes and deadlines and so on, but please spread the word to all of those talented young would-be scientist-musicians out there. And the closing date for entries will be before Green Man in August – so get writing! The competition has been made possible by the support of the Institute of Physics and I’m a Scientist, Get me Out of Here! So big thank yous to everyone involved. This entry was posted in Uncategorized and tagged entertainment, science by martin zaltz austwick. Bookmark the permalink. Hope this will be open to students who have left school this year too!